The second dish in my Dinner Party Through Time menu, and we have moved along a couple of hundred years to Tudor Britain. This is a recipe that is inspired by the Tudor love of combining fish with candied sweetmeats. Large medieval banquets had to contain dishes with lots of spice; after all how else could you display your vast wealth other than to use that exciting spice, sugar? When first brought to Europe from India, sugar was considered a spice and therefore medicinal. It lost its rank as a spice once it gained popularity as a more general addition to the dinner table; albeit a giant banqueting table. The addition of the salmon, then, you might feel was also a mark of an ostentatious lord. 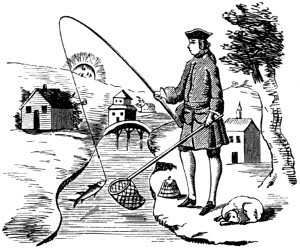 It is not the case, back in the day, before such things as pollution and overfishing, streams were teeming with fish like salmon. In fact they were so common on the River Mersey that people used to feed them to their pigs! The same, of course, goes for oysters too, and yet we can now buy a pound of sugar for 30 pence. How times have changed. This dish is very attractive: a lovely fish wrapped neatly in pastry with some sweet spice, fruit and nuts, plus a nice piquant herb sauce. It’s pretty easy to make to boot, as long as you have good shortcrust pastry. This was so good, that it became the main course at my last pop-up restaurant. This recipe is actually from Jane Grigson, who did the tricky bit for us and worked out a recipe. It comes from her book English Food and I suggest you buy a copy (see the other blog about that!). The only real difference I’ve made is to multiply up the amounts; I used a whole salmon, rather than just a piece as in the book. Beat the softened butter with the preserved ginger, raisins and almonds. Sweeten with the syrup as you see fit. Use half of the mixture to sandwich the two pieces of salmon together and then spread the remaining half over the top piece. Season with salt and pepper. Now you are ready to encase the beast in pastry. 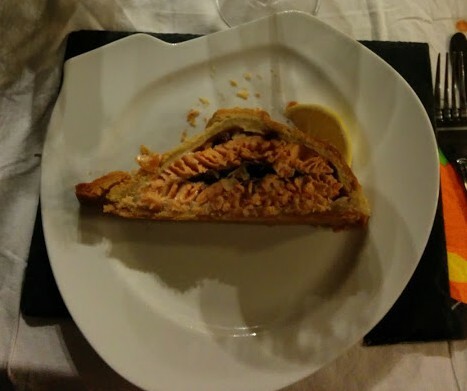 I used a batch made of 800g flour and 400g of fat (200g each lard and butter), 2 eggs and a little water, but you might need more or less, depending upon the size of your salmon. Roll out a third of the pastry into a shape larger than the fish and place it on top. Trim around it, leaving a two centimetre gap. Next, roll out the rest and carefully place it over the fish, trimming the pastry away so there is a one centimetre gap between it and the lower layer. 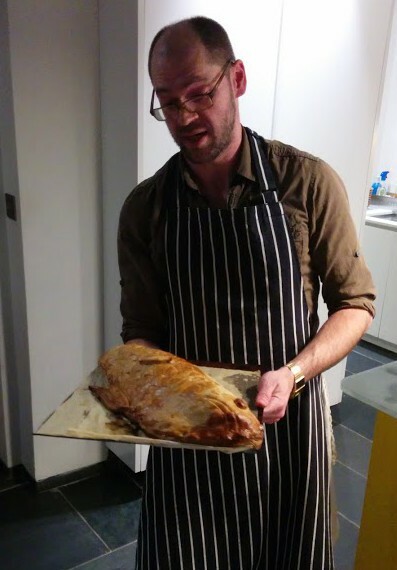 Brush with beaten egg all around the edges, and fold and crimp the pastry all the way around; rather like a huge pasty. Use the trimmings for decoration. There were a few small cracks in my pastry, but I hid them most cleverly with some pastry leaves that I placed here and there. I must say, I was quite impressed with my effort. Make two or three slashes on the top so that steam can escape and bake for around 45 minutes at 220⁰C (425⁰F). To tell that it is done use a temperature probe; if the centre is around 50⁰C it’s ready to come out. As the fish rests, it will increase in temperature. As it rests, you can get on with the sauce. Gently fry the shallots and herbs in butter. When the shallots have softened, stir in the flour, then the cream (reserving a little for later). Simmer for around 10 minutes, then season with salt, pepper and mustard. Whisk the egg yolks with the reserved cream, turn down the heat in the pan and pour in. The sauce will thicken as the yolks start to cook – do not let the sauce boil, or your yolks will scramble. If it seems on the thick side, add a little water. Finally, lift the whole thing by adding a good squeeze of lemon juice. The rested salmon can now by sliced up. The best way I find to do this sort of operation is to use a serrated knife. Slice the untidy end off, but keep it pressed up against the rest of the fish as you make more slices. Don’t take away any slices until you are finished cutting, otherwise everything will crumble and collapse. The best thing to eat with this, I would say, is a green bitter vegetable such as broccoli or kale. The first course of my Dinner Party Through Time was a little amuse bouche from a mediaeval recipe dating around 1400. 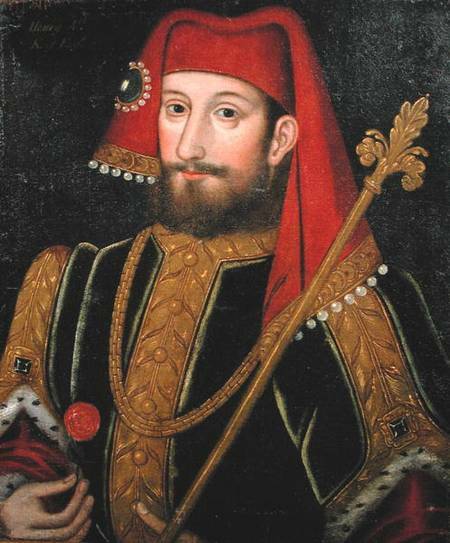 On the throne was Henry IV, Geoffrey Chaucer was a contemporary; indeed, he was present at his coronation. The recipe calls these little mouthfuls tartlettes, but they are actually more like a stuffed ravioli or even dim sum. Left-over pork is ground up with spices and other flavourings, wrapped up in a paste and simmered in salted water. Unfortunately there’s no photographic evidence of this dish so you’ll have to make do with a picture of Henry IV and imagine him eating one. Take pork ysode and grynde it small with saffron, medle it with ayren and raisons of coraunce, and powder fort, and salt; and make a /bile of dowhg and close the fars thereinne. Cast the tartlettes in a pan with faire water boillyng and salt. Although it is relatively simple to cook, this was very much a rich man’s dish with saffron and currants as well as powder fort. This was a commonly used spice mix made up of ground ginger, cumin and long pepper. Long pepper is very difficult to source these days, so for my version of the recipe I used regular black pepper. I could have covered my meat mixture, or ‘farce’, in thinly rolled fresh pasta, but instead went for the less fiddly option of using filo pastry. I wasn’t convinced that the tarlettes would taste good boiled as in the recipe, so for the dinner party, I simmered half of them and baked the remainder. It turned out that everyone preferred the simmered tartlettes. How little faith I had! To begin, mince the cooked pork and thoroughly mix in the salt, powder fort, currants, cream and the egg yolk. Unfold three or four sheets of filo pastry. It can be a tricky number to keep it from drying out, but you should be able to avoid any major disasters by keeping the pastry sheets covered with a damp tea towel. Cut a strip of filo three centimetres thick and roll a generous teaspoon of the mixture in the filo strip. You are aiming to cover the filling with two or three layers of pastry so there may be enough in one strip for more than one tartlette. Seal the pastry with a light brush of egg white. Continue until you have used up all of the mixture. Cook the tartlettes by dropping them into simmering salted water for three or four minutes, remove with a slotted spoon and drain them carefully on some kitchen paper. Eat them immediately. If you don’t want to boil your tartlettes, they can be brushed with more egg white and baked in the oven at 200⁰C for 8 minutes or so.